I was very recently invited to a large black-tie charity ball as a thank-you for the volunteer work my wife and I have done over the years. Once there I realized it was an even bigger deal than I had thought. Some of the gowns were spectacular, featuring expensive fabrics and fine details, including lots of tiny sparkling things I assumed were crystals and gems. I was horrified to see another guy wearing the same tuxedo as mine. The patrons who attend events like this may have spent several thousand dollars on a designer dress, handbag, and shoes. They may also own several designer dresses and a multitude of shoes and handbags, very likely stored in closets like these. It got me thinking about whether or not these dresses were covered! Designer dresses, or couture, can take thousands of hours, incorporate rare and expensive fabrics and be inlayed with up to thousands of precious stones. The most expensive dress ever made cost $30,000,000 and included a borrowed 70-carat red diamond. Most couture dress don't come close to that, but many easily run into the thousands of dollars. Do you assume your clients wouldn't spend that kind money on a dress, handbag, or even a pair of preciously priced shoes? You might be surprised. An informal internet poll showed better than half of women owned at least one high end handbag. It stands to reason the average high-net worth homeowner will own several at least and why not, it's supposedly good for you to buy a luxury item now and then. Couture - All garments made by a couturier and valued at $10,000 or more per garment, may be scheduled. Ready-to-wear - All ready-to-wear garments valued at $2,500 or more per garment may be scheduled. Shoes and handbags - All shoes and handbags valued at $500 or more per piece may be scheduled. Collectible accessories - Up to $2,000 per item is provided for miscellaneous collectible accessories-from millinery to gloves to leather belts and beyond. No scheduling is required. AIG recognizes the value of preventing a loss with their proactive risk management which includes; vulnerability assessment, emergency planning and referral services. 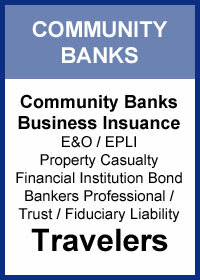 AIG's Private Client Group homeowner coverage is available for $750k or more with a minimum of two lines of business. The AIG Wearable Collections Program is currently available in AR, AZ, CA, CO, CT, FL, GA, IL, LA, MI, NJ, NM, NV, NY, OR, PA, RI, TN, TX, VA & WA. Nationwide availability expected before the end of the year. AIG's Private Client Group homeowner coverage is available to registered members in all states. Log into www.bigimarkets.com to learn more! 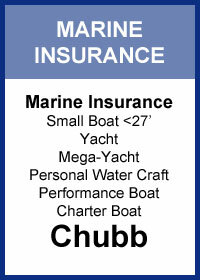 * Includes a $500 deductible, $5,000 per item limit, and $15,000 aggregate per year. Diminution of value is excluded. Can't make it to Scottsdale for the Feb 17 & 18 2016 ACT Meeting? Want to learn more about the most important technology trends and topics affecting independent agencies and the insurance industry? Watch the Agents Council for Technology meeting without having to leave your desk. The live streaming event, sponsored by Citrix ShareFile, will broadcast on Wednesday, Feb. 17 from 1:00 pm-5:00 pm MST (3:00-7:00 pm EST). Agency Management Systems Panel: This interactive agent panel will discuss how to create a roadmap of functionality needs for agency management system of the future. The panel will be moderated by Boyd McGehee, Chair of the IIABA National Young Agents Committee. Reporting, Analytics & BI: Lead by Scott Roddy, Sr. Director of Advanced Analytics at Safeco, this session will tackle how agents can use reporting, analytics, and business intelligence to improve agency operations. The discussion will also cover the differences between these disciplines and where they are headed. Agency 2025: Learn how Young Agents see the future of their agencies-and the industry--through this video competition. 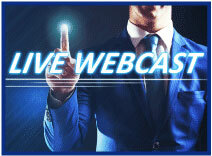 Register now to join the live streaming event! To learn more about the meeting agenda, visit the ACT website. 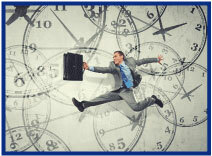 Every time an insured calls your agency for a surety bond, you enter a race and a clock starts running against you. At the end of the race is your agency's reputation for knowing the marketplace and getting things done - and perhaps, your insurance relationship with that client. Did you know there is an alternative - one that relieves your agency of the burden of dealing with surety bonds altogether while also ensuring a prompt, thorough and professional response every time an insured calls for a bond? 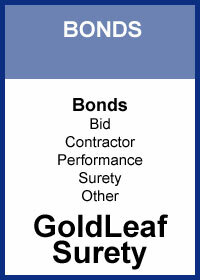 Big "I" members can contact Goldleaf by logging onto www.bigimarkets.com (select the appropriate bond type from the bond options on the commercial markets menu) or by calling Goldleaf directly at 1-888-294-6747 (ask for Lori Olson). Advertising vs. Contingency Payments - Which is Greater? Last week we looked at Super Bowl advertising and the insurance industry and we promised to contrast what P&C insurers spend on advertising and what they spend on contingency payments. 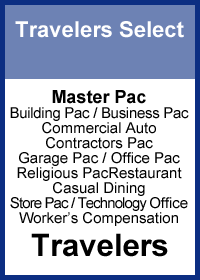 Below are those payments for the last 10 years. 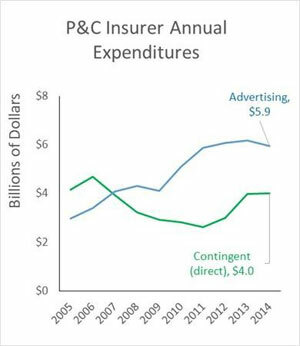 Insurer expenditures on advertising have steadily increased. Contingency payments dipped after the Eliot Spitzer investigations in 2004 and 2005 but have since rebounded. 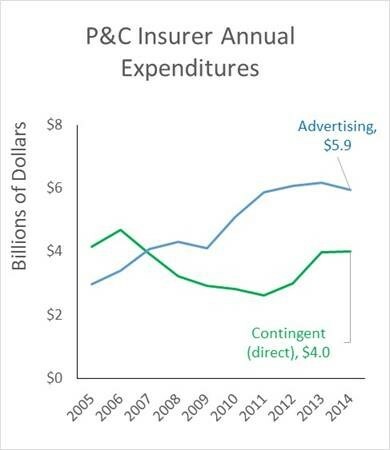 Which do you think brings a P&C insurer the most value per dollar spent? My answer would be "it depends." Email your thoughts if you'd like to share to bigimarkets@iiaba.net. Congratulations to our agent in North Carolina on a real estate E&O sale of $2,790 in premium!